If you’re more into breakfast in bed, you could try these sweet Baked Whiskey-Soaked Apple Fritters with Maple Whiskey Glaze or the more savory Furikake Hashbrowns with Kalua Pork & Kimchi. 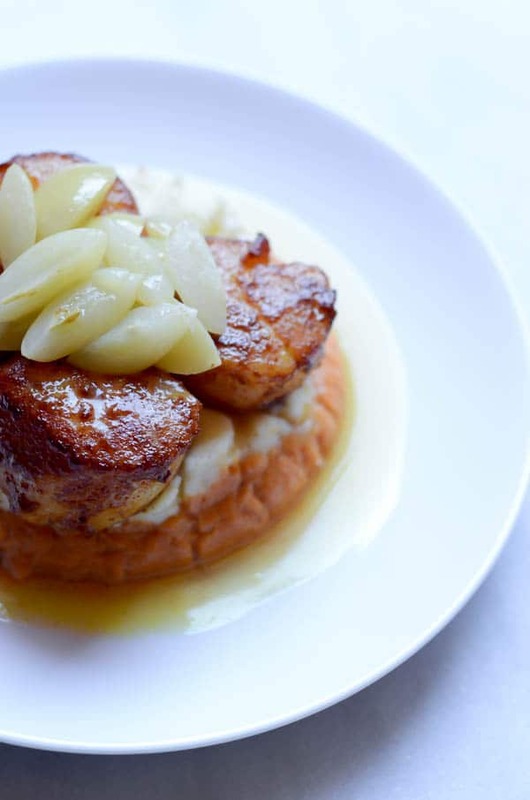 Or, if you’ll be celebrating “Gal-entine’s Day” instead (which I think is a great idea BTW) then you can pair these Lychee Lightnings with Crab Zucchini Stuffing Cakes or this Tropical Rum Runner with Mango Salsa. If you want to impress your man and don’t like the idea of a Scallop Sundae (but how dare you, because it’s delicious), you could always start off the evening with a Blackberry Bourbon “Jammer” paired with Bacon Wrapped Stuffed Dates, segue into a second course of Caramelized Leek & Parsnip Soup, and finish with the ultra-chocolatey, mouthwatering Chocolate Brie Dessert Pizza. So many options! But enough about the recipes that I’m not featuring today, let’s talk Scallop Sundae! This was another fun dish that my dad and I created together (the trouble we get into sometimes) and I make it every time there’s a special occasion (and Valentine’s Day definitely counts as a special occasion, I’ll take any reason to celebrate, even if it’s a Hallmark holiday.) I like it as a “special occasion” dish because it’s just as easy to make for two people as it is to make for four or more. For the recipe I’m sharing with you today (and because of this couple-centric holiday) I’ve included the ingredients for just two servings, but you can certainly double or triple it to feed however many people you’d like. 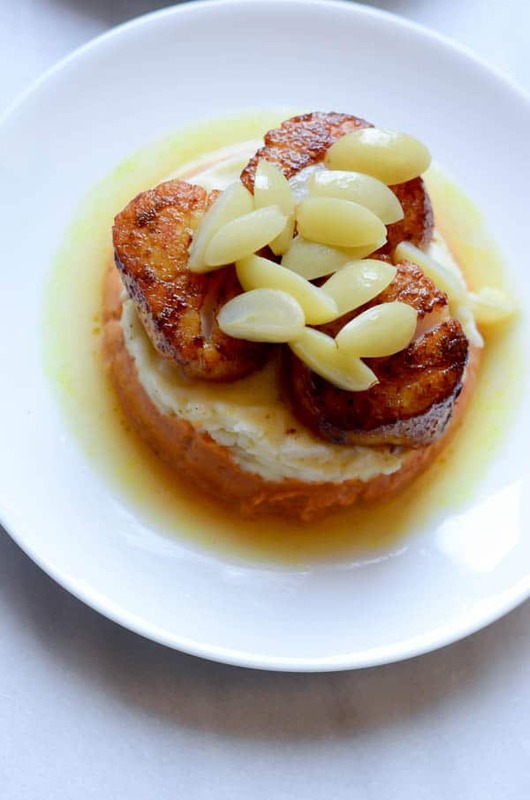 Our Scallop Sundae goes like this: We start with a base of cinnamon whipped sweet potatoes, and then pile some creamy garlic mashed potatoes on top of those. 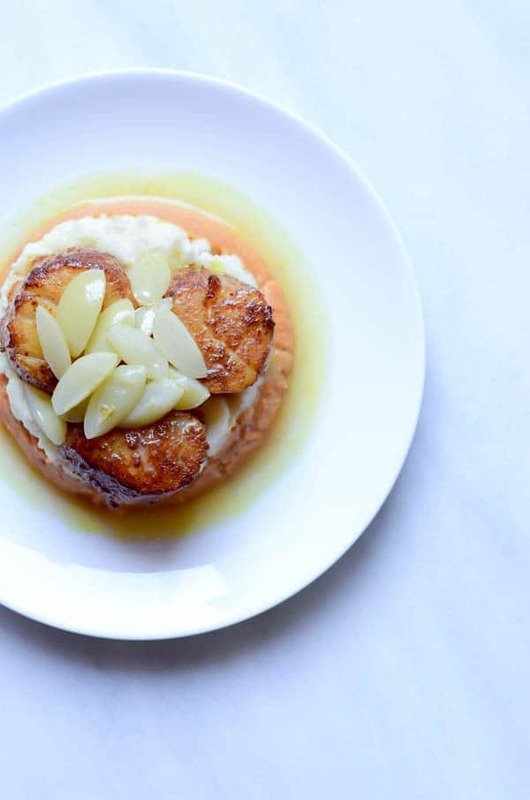 We grace the top of the taters with some beautiful, perfectly cooked, perfectly seared curry-crusted jumbo sea scallops and finally, drizzle an elderflower-grape-white wine sauce all over the top. Has your mouth started watering yet? Not only does the Scallop Sundae taste delicious, but with a little bit of finesse (and some of these) you can really make the plate presentation just as good as something you’d order at a restaurant (because who wants to brave the craziness of a romantic restaurant on Valentine’s Day?) This dish is bursting with spices and flavor and is finished off with just the right amount of sweet creaminess from the sauce. 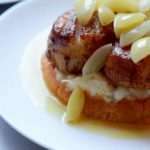 You definitely want to do yourself a favor and start sourcing the juiciest, freshest jumbo sea scallops you can find so you’re stocked and ready to make this come Sunday. Who’s with me? Delicious, mouthwatering, curry-crusted scallops served on top of a medley of mashed potatoes and finished with a delicious elderflower-grape-white wine sauce. Begin by boiling both types of potatoes. Since you’re only using one of each type, you can certainly use the same saucepan. Place potatoes in saucepan and fill with water so that there’s ½ - 1 inch above the potatoes themselves. Place on a burner over high heat. Bring to a boil. Turn heat down (but still simmering) and cook potatoes until you can easily stab a fork through them. Once potatoes are done, strain them and separate the sweet potato from the baking potato into two separate bowls. In the bowl with the sweet potato, add the cinnamon, butter and milk. 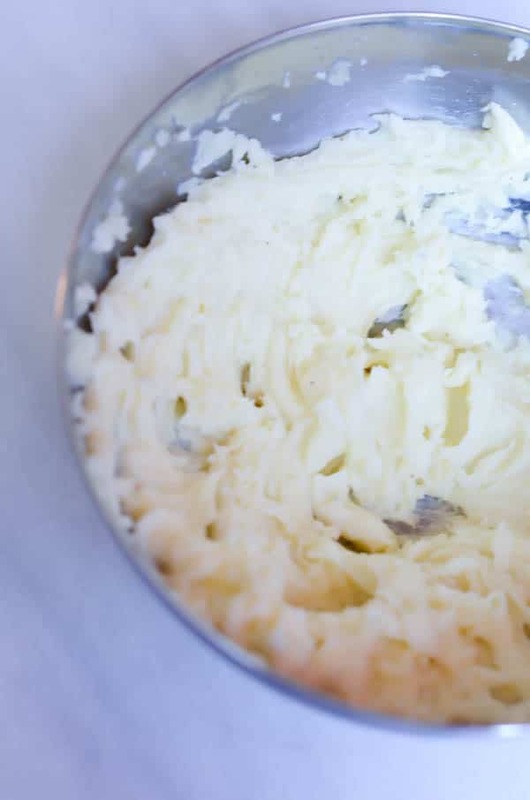 Mash by hand or using a hand mixer until all ingredients are combined. Season with salt and pepper as needed. Set aside. In the bowl with the baking potato, add the garlic, butter and milk. Follow the same process as above. Begin cooking the sauce: In a small saucepan over medium heat, combine the elderflower liqueur, grapes and sparkling wine. Do not add the butter yet. If sauce begins bubbling too much, lower the heat. You want the sauce at a constant gentle simmer. 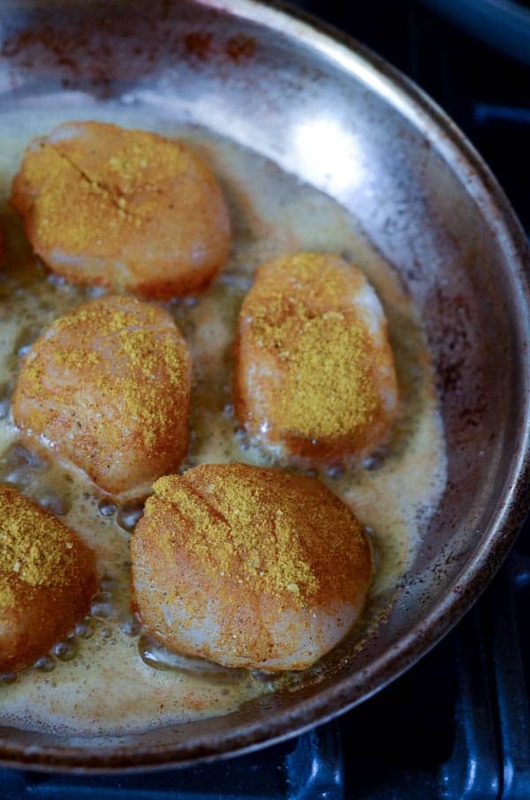 Prep the scallops: Combine curry powder, salt and pepper in a small bowl. Place scallops on a plate and coat them in the curry mixture, covering all sides. Add 1-2 tablespoons butter and 1-2 tablespoons canola oil (these are your “additional ingredients”) to a large sauté pan over medium-high heat. Heat pan until it sizzles when you splash some water on it. This means it’s hot enough to give the scallops a good sear. Carefully add scallops to the hot pan, being sure not to overcrowd. If you need to, sear the scallops in two batches. Sear the scallops on the first side for 3-5 minutes, or until they are opaque about two-thirds of the way up. Flip over for 2-3 minutes to finish cooking. It’s important that you do not overcook the scallops. They will continue to cook for a bit after you remove them from the heat, so keep that in mind. Finish off the sauce by adding the two tablespoons of butter. Stir to melt and incorporate. Now it’s time to plate! 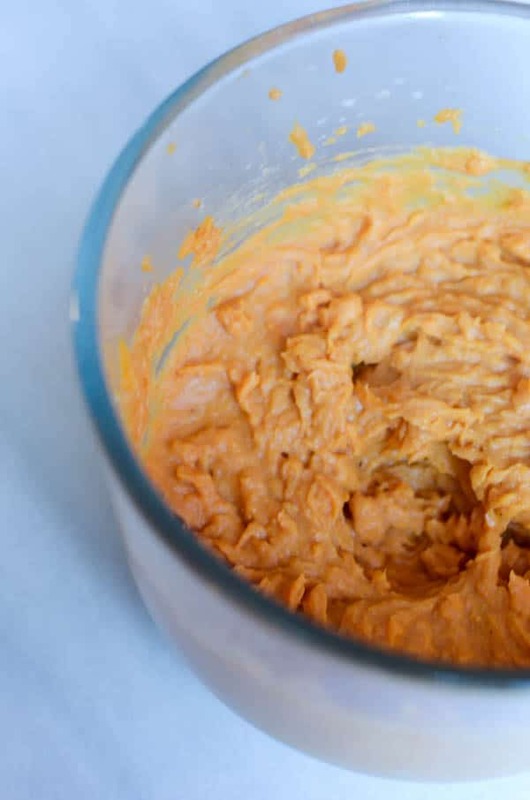 Start with a base of the cinnamon whipped sweet potatoes. You can either just plop a scoop onto the plate, or use one of these culinary rings if you want to be fancy. Top the cinnamon whipped sweet potatoes with the garlic mashed potatoes. Top with 3-4 scallops, then drizzle the sauce over the top. Serve immediately. Wine Pairing Note: Because there is sparkling wine in the sauce, some of the same would be the perfect pairing for this dish. It would also be great with a Chardonnay that has a perfect balance of acidity and creaminess. Sundaes on Sunday? I’m all about it. Ohh what a good idea! 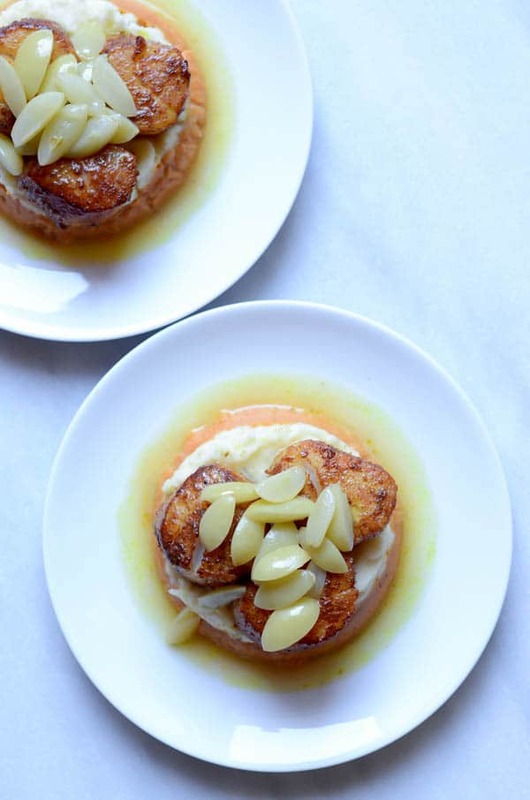 A different take on scallops. The plating is beautiful too! 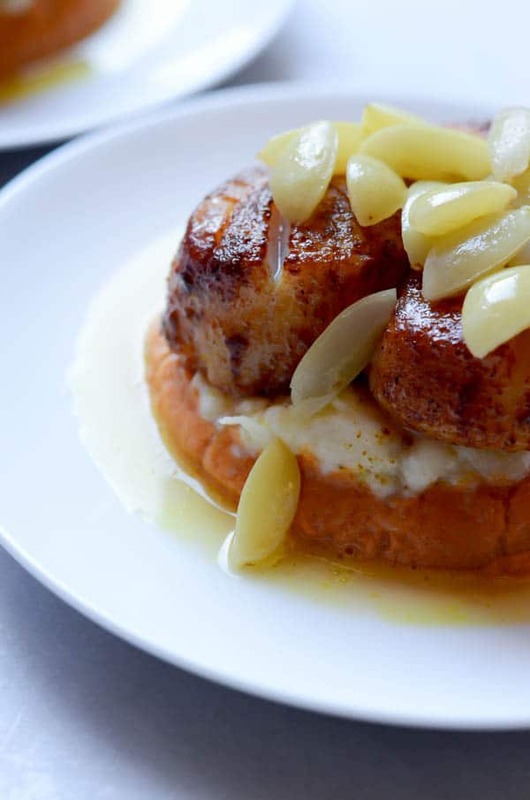 What a great new take on scallops! Yum! This sounds like such a delicious dish! I am a vegetarian, any alternative to replace the scallops? Hi Kusum! I think tofu would be a great alternative since the textures are fairly similar 🙂 If you make it, please let me know how it goes!